Homeless shelters are an invaluable resource for the individuals they exist to serve. As an owner or a manager of a shelter, your clients have numerous responsibilities, both ethically as well as financially. Homeless shelters provide a necessary resource to the needy, and many homeless shelters even support a number of other programs to assist homeless individuals. It’s imperative then, that these managers and owners have the right insurance coverage to protect their organization’s finances in the case of a claim. In addition to obtaining the right insurance program, they should know what legal issues are most commonly faced in homeless shelters, and how to best handle them in order to possibly prevent community action liability claims. According to the National Alliance to End Homelessness, researchers estimate that anywhere between 5 and 7.7% of America’s youth experience homelessness every year. In many cases, homeless shelters are tasked with the decision on whether or not to report these youth to child protective services. This is an especially difficult situation when a family is experiencing homelessness together, as it means separating a child from their parents. There have been ongoing debates about what is the ethically and legally right thing to do when it comes to these situations. Unfortunately, making the wrong decision could lead you client to facing a Professional Liability claim. In addition to youth, homeless veterans raise ethical concerns. Unfortunately, each year more cases are discovered involving homeless shelters abusing federal and state assistance in order to serve veterans. Due to the overpopulation of veterans in homeless shelters because they are not able to always get government aid on their own, homeless shelters that aren’t in the wrong are finding themselves facing these types of accusations as well. Even if a legal claim is unfounded, a homeless shelter could still be financially devastated due to paying legal fees to defend their case. 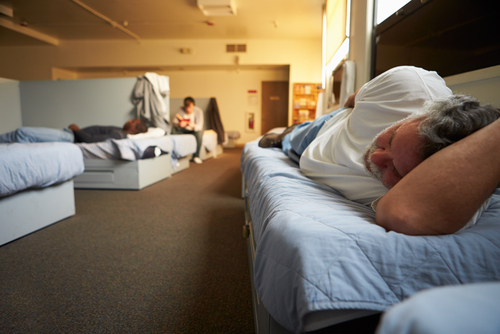 Homeless youth and veterans are not the only reasons that homeless shelters face legal issues. Other problems involve shelters not having enough supervisors, attorneys, or social workers on staff, or not having an appropriately upgraded facility. Unfortunately, this is often due to funds. Nevertheless, it’s important for your homeless shelter clients to be aware of what the state and federal guidelines are regarding these issues. At Care Providers Insurance Services for Community Action Agencies, we understand the unique risks faced by your Non Profit clients, including those who run or manage a homeless shelter. Over the years Care Providers’ exclusive program has expanded to include many non-profit classes, including Community Action Agencies (CAAs) – vital to our nation’s continued fight against poverty. Please contact us today for more information at 855-790-7379.